Packed with information and tips on online marketing for your travel business. In the ebook, you’ll find how to design landing pages to get new bookings, run online ads to drive people to your page, email marketing campaigns to nurture leads, and more. In the 2016 tourism trend report, you will learn about the most important trends that are influencing tourist behavior, how the industry needs to adapt to keep up with today’s traveler, the state of tour and activity industry, and more! Every travel business can benefit from awesome SEO (search engine optimization). It can send tons of visitors to your website and in the long run, create new clients. In this ebook, SEO experts will weigh in on how you can get started and dominate SEO. With over 400 million Instagram users, we created a guide to help travel businesses maximize on the social media marketing opportunities that Instagram has. In the ebook, you’ll learn tips and tricks to help edit eye-catching photos, the best times to share photos, as well as tips from the pros. Author, Kelly Monaghan, CTC, has been studying the home-based agent scene since the early 90s. She has led home courses and trained thousands of home-based agents. In the ebook, she shares what she has learned along the way and what separates a winning home-based agent from others. You can purchase this book in paperback or download to your Kindle for free. 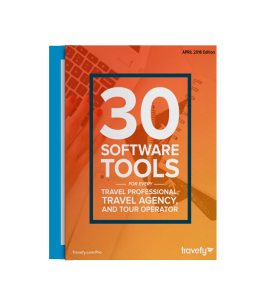 Software can help build a business and these top 30 will not disappoint. From free design tools to build amazing graphics for your company blog to simple communication tools to create an award-winning customer service experience. The rise of the internet has created a world of new opportunities for your tour or activity business. It’s time to embrace the internet and use its power to supercharge your business! Email marketing is arguably the most powerful channel for lead generation. If you don’t already have a strong email marketing strategy, you should start building the knowledge and start creating new leads and increase revenue today! Did you know that on average, blogging increases website traffic by 55%? 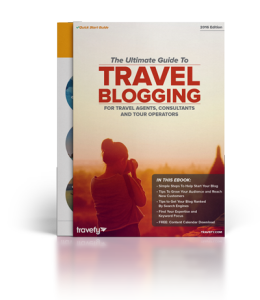 It’s no secret that blogging can do wonders for your travel business. We’ll show you how to use blogging as a way to engage clients, create new leads and get more traffic to your site with SEO. Do you have a favorite ebook not mentioned above? Share it with us in the comments!